The Hussein-era chemical weapons compound seized by the Islamic State (ISIS/ISIL) in June contains materials that may still be toxic, according to the Pentagon. 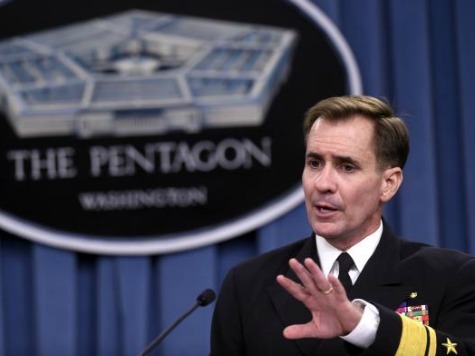 However, Pentagon spokesman Rear Adm. John Kirby, during an October 15 press briefing, asserted that it would be “very, very difficult” for the jihadist group to “weaponize” the chemical agents at the Al Muthanna State Establishment, a compound known as the nexus for Iraq’s chemical weapons program under Saddam Hussein dating back to the 1980s. Kirby said there is no evidence “right now” that ISIS militants possess chemical weapons. The spokesman was asked about an October 14 report from The New York Times, which mentioned that ISIS militants may have access to chemical weapons that have been lingering in Iraq since Hussein’s rule. “We have no indications right now that they have possession of those kinds of munitions,” he responded. “We still believe it would be very, very difficult for them to kind of weaponize it,” he added. “Now, again, information isn’t perfect,” he conceded. “We aren’t viewing this particular site and [the Islamic State] holding it as a major issue at this point,” Kirby added later. Even if they are able to access the materials, “It would likely be more of a threat to them than anyone else,” according to the Pentagon spokesman. Breitbart News reported that a Middle East watchdog organization recently published disturbing photographs suggesting that in July, ISIS militants used chemical weapons against Kurdish fighters that may have originated from Al Muthanna. Since June, the [Al Muthanna] compound has been held by the Islamic State, the world’s most radical and violent jihadist group. In a letter sent to the United Nations this summer, the Iraqi government said that about 2,500 corroded chemical rockets remained on the grounds, and that Iraqi officials had witnessed intruders looting equipment before militants shut down the surveillance cameras. According to the article, the compound is “a principal source” of the nearly 5,000 chemical weapons that the U.S. military “secretly reported finding” in Iraq after the American invasion in 2003. The American government refused to publicly disclose those discoveries. U.S. and U.S.-trained Iraqi troops were wounded on at least six occasions by the chemical arms they encountered in Iraq between 2004 and 2011, according to the article. About 20 American soldiers were exposed to chemical agents after the 2003 invasion, Kirby told reporters. The responsibility to investigate the chemical exposure incidents is going to fall on the military services, not the Pentagon, he added.